As one of many Jean-Georges V. restaurants in NYC, Perry St faces the reputation dilemma – if it’s good, that is expected. If it’s bad, you are doubly disappointed. Lucky for me, Perry St fell into the former category. 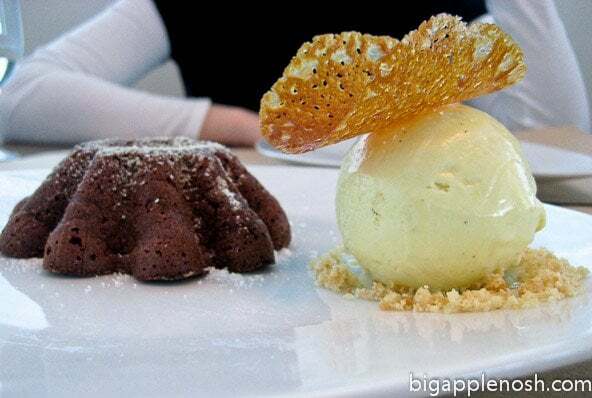 I recently went for its prix fixe menu – at $26 for two courses and dessert, it is a reasonable brunch option. I’ve had good mozzarella, and I’ve had bad mozzarella. At it’s worst, it’s gummy, squeaky, crunchy or even worse. Luckily, this mozzarella was none of the above – it was soft but elastic, only lightly salted, and it absorbed the flavors of the Thai basil and olive oil. 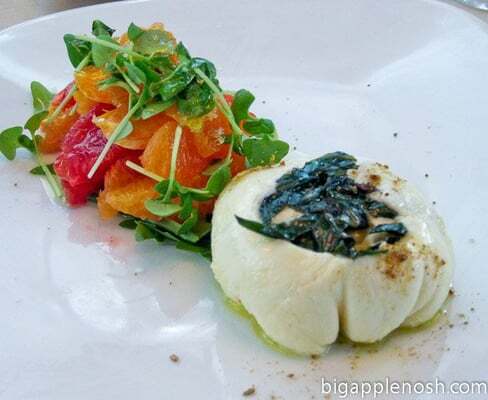 The orange and grapefruit salad provided a pleasant, slightly sour counterpoint to the creamy cheese. My eating buddy had the peekytoe crab salad hot mustard and granny smith apples. 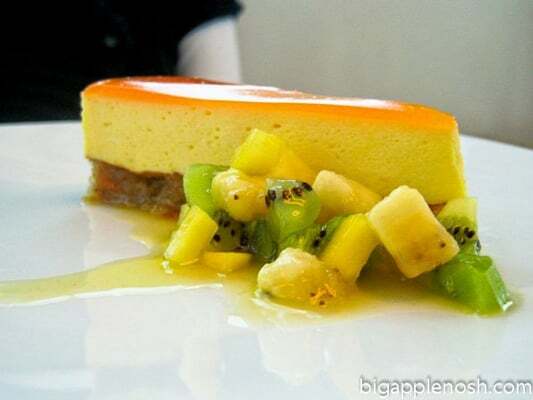 I love tart flavors paired with seafood, and this dish was a perfect example. 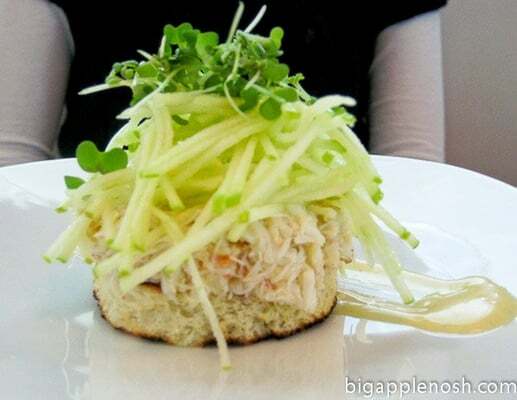 Without relying too heavily on mayonnaise for the crab salad, the freshness of the crab and ripe apples shined. For my second course, I ordered the slowly cooked salmon with truffle vinaigrette and steamed maitake mushroom (first picture). I loved this dish. 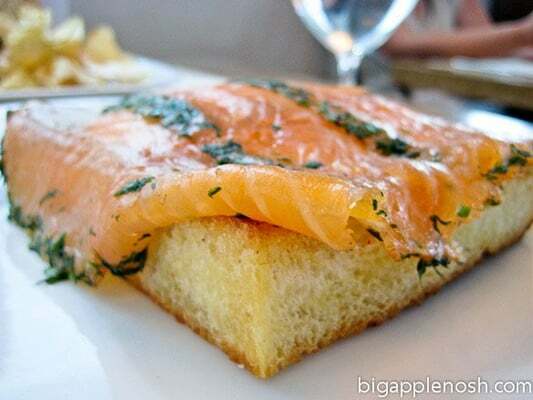 I’m a fan of gravlax/lox/smoked salmon and its permutations, and this one didn’t disappoint. It was aromatic without being overly fishy, and the mushrooms and truffle vinaigrette provided a well-rounded flavor. The bread was toasted and buttered – mmmm. My eating buddy had the roasted chicken sandwich with chipotle-lime mayo and avocado. I’m always a little hesitant to order chicken – I’m a dark-meat gal, and most white meat served in restaurants is a little dry for my taste. However, this chicken was juicy and tender, and the mayo and avocado also added a level of moisture. The chips were quite typical, in my opinion. The cake had a rich and flavorful center – few things annoy me more than chocolatey-looking things that are actually quite flavorless. This was not the case here. The vanilla bean ice cream was also delicious – you can see the real bean pieces, so you know they’re not faking! The citrus cake was light and refreshing – I would have liked a little more tart-ness, but it wasn’t sickly sweet, so I still gobbled it up. 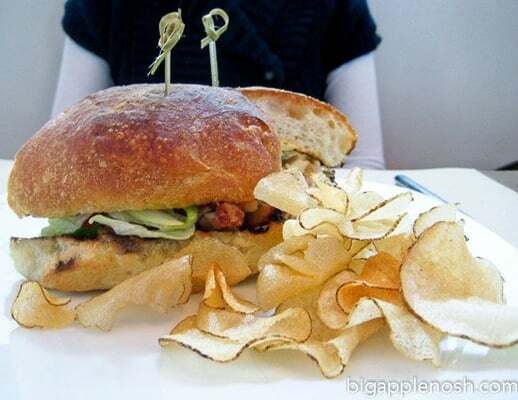 Perry St’s portions are ample but not overwhelming, and the decor is clean and minimalist. Being right off the West Side Highway, it’s a bit of a walk from the subway, but I’d recommend trying it at least once! Reservations recommended. A bit of a walk, but worth it for the Prix Fixe brunch. Your the only person I *know* that is a dark meat chicken fan! ooh that looks yummy. the brunch is a pretty good deal! @Layla, that's so funny; several of my friends prefer dark meat chicken as well! We should eat a chicken together; we'd polish that thing off. Oh wow, that looks so yummy! I always read your blog and curse myself for living in Austin and away from all this delciousness!